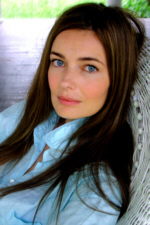 When Paulina Porizkova was three years old, her father and mother left Czechoslovakia after the Soviet invasion in 1968 and moved to Lund in the south of Sweden. They left Paulina under the care of her grandmother, believing she could be brought later. However, the Czech authorities would not allow it, and the ensuing battle for Paulina made headlines in Sweden. The young couple pleaded with the media using pictures of young Paulina clutching a teddy bear to make her a cause célèbre. After a failed rescue attempt where her mother ended up detained by Czech police, political pressure caused the government to finally allow the Porizkova family to reunited after seven years. The joy was soon ended when Paulina’s parents divorced. This left Paulina’s mother busy supporting her children and funding her own medical school education, leaving a ten-year-old Paulina to fend for herself and her three-year-old brother. A photographer friend took pictures of Paulina and sent them to Elite modeling agency in 1980. Elite head John Casablanca saw Paulina’s potential and offered her a ticket to Paris. She quickly rose up to become a top model in Paris during the early ’80s. Her stardom exploded across the pond with winning the coveted spot on the Sports Illustrated Swimsuit Issue in 1984 and then again in 1985. (Her first appearance was in 1983.) A third consecutive run as covergirl was dashed when she appeared on the cover Life in a swimsuit. Both of her calendars in 1988 and 1989 by famed photographer Marco Glaviano sold hundreds of thousands of copies, setting a standard that paved the way for other models like Cindy Crawford for their own pin-up calendars. She was chosen twice by People magazine as one of the 50 Most Beautiful People in the world, in 1990 and 1992. Harper’s Bazaar magazine named her one of the ten most beautiful women in 1992. American Photo magazine in its premiere issue declared her to be the model of the 1980s. She appeared on the covers of countless magazines around the world during the 1980s and 1990s, including numerous appearances on Vogue, ELLE, Harper’s Bazaar, Self, and Glamour, often side by side in the same month. In 1988, Paulina won what was then the highest-paying modeling contract, a $6 million-a-year contract as the face of Estee Lauder. The classy black-and-white television and print campaign won plaudits from critics and Estee Lauder makeover transformed Paulina’s public image from a sexpot to the epitome of European sophistication. Paulina headlined the first ad campaign for Knowing perfume in 1987. After having her first child, Paulina devoted less and less time to modeling and concentrated on acting in independent films. Paulina’s film debut was in the 1983 modeling pseudo-documentary Portfolio. Still only seventeen, she managed to look more mature and intelligent than the other more established models and became the literal “covergirl” for the film. Porizkova appeared in the 1987 movie Anna, receiving glowing reviews from her patrons at Vogue magazine. It was in 1989 that she would land her biggest, and most known role to date, co-starring with Tom Selleck (hot off the trails of his Three Men and a Baby success) in the film Her Alibi. Paulina starred in the bizarre cult film, Arizona Dream with Johnny Depp and Jerry Lewis, in a minor role as the young Polish fiancée of Lewis. Her films Thursday (now a cult hit) and Long Time Since were both shown at the Toronto film festival in 1994. She went on to acting in independent, small films alongside Catherine Deneuve, Al Pacino and others. In 2004, she starred in the independent film romantic comedy, Knots. A MODEL SUMMER a first novel is scheduled for publication in June 2007 by Hyperion Books. On August 23, 1989, Porizkova married Ric Ocasek, the lead musician with the group The Cars and a fellow Czech. They had met in 1984 on the video shoot for The Cars’ music video “Drive”, directed by Timothy Hutton. The couple has two sons, Jonathan Raven Ocasek, born November 1993, and Oliver Orion Ocasek, born May 23, 1998. They live in New York City.